Mizuma Action presents ‘STAR ATLAS’, an exhibition by OSHIMA Kozue from January 12, 2011. Oshima says the ‘hearts’ of people living in the overripe society of contemporary civilization ‘belong to the ether.’ While she herself became unaffected by our existences filled with objects and as she feels that void, she crystallizes into her works the fancies and shapes born from the universe of nature and plants which she has kept being fascinated by since her tender youth. In the present exhibition Oshima especially focuses on the wide universe and nature expanding above our heads. 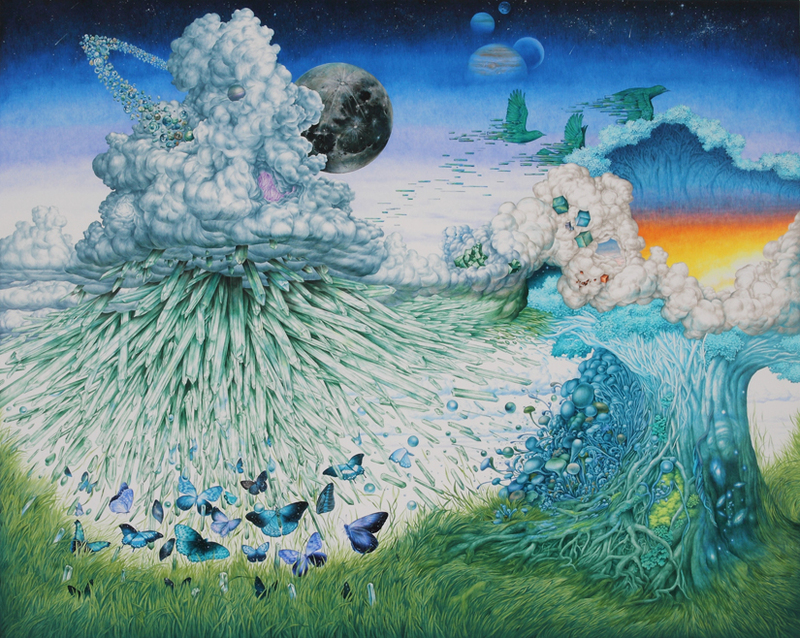 In the manner of the people that since ancient times have been looking up to the sky, connecting stars to create stories, Oshima’s paintings seem to depict the map of connections between nature and the artist herself, floating in the ether. She puts into form landscapes that consist of the links she ties between the different natural shapes and times. Like the butterfly flapping its wings as if they supported the entire universe, a small point of observation spreads to become the cosmos by Oshima’s inexhaustible curiosity and endless imagination. The resulting star atlas then opens to suggest that the origin of all things is one, that all living creatures are fragments of the universe. Oshima’s second solo show, one year and a half after her first, consists in 14 drawings and paintings, further deepening the universe of her work. We invite you to experience this exhibition, an ambitious challenge toward a renewed perspective.